Terrariums are super cute, especially if given as a gift. 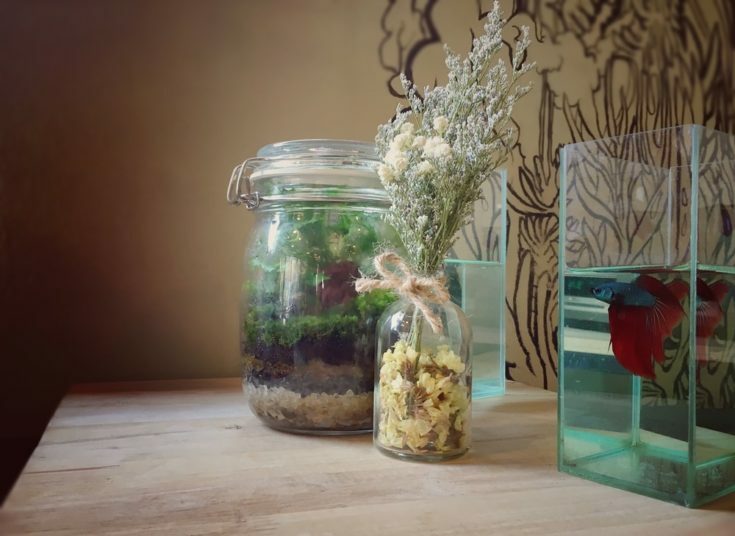 Terrariums are essentially little (typically glass) vases or bubbles that are filled with decorative nature scenes such as gardens, mountains or even the more Zen tea garden. Terrariums are most commonly used with plastic plants, but real plants can also be put in their place for an added intrigue. 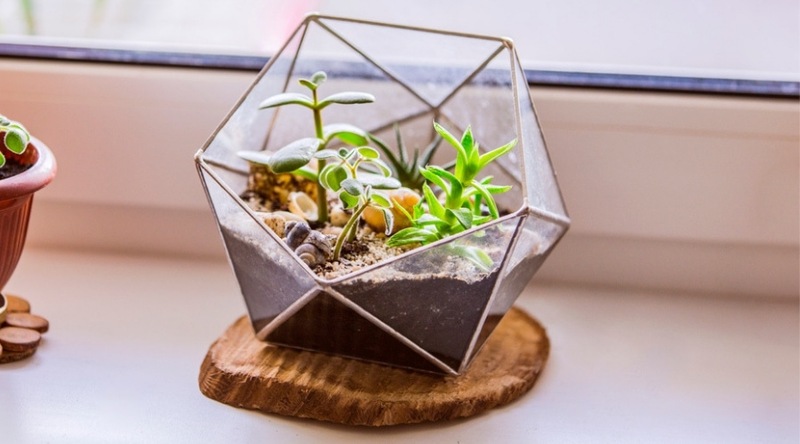 Whether you are looking for a glass garden as a gift, or simply want one for yourself, we’ve compiled some of the best small terrarium ideas you can find to either purchase or create all on your own. Keep reading and get ready for some serious cuteness! 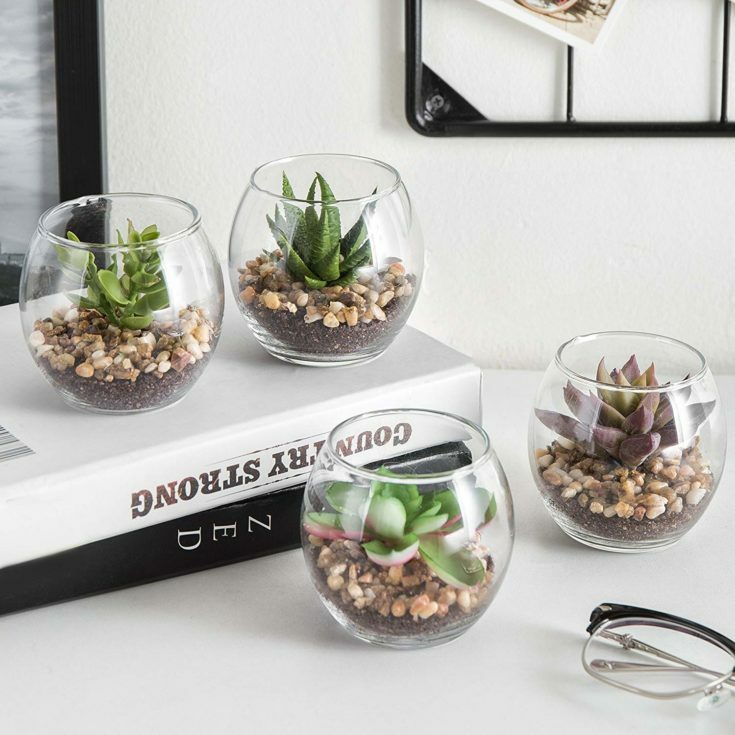 This glass terrarium would make the perfect complement to a desk or windowsill. This adorable glass bubble keeps within it plenty of moss nestled against the delicate walls of this terrarium. 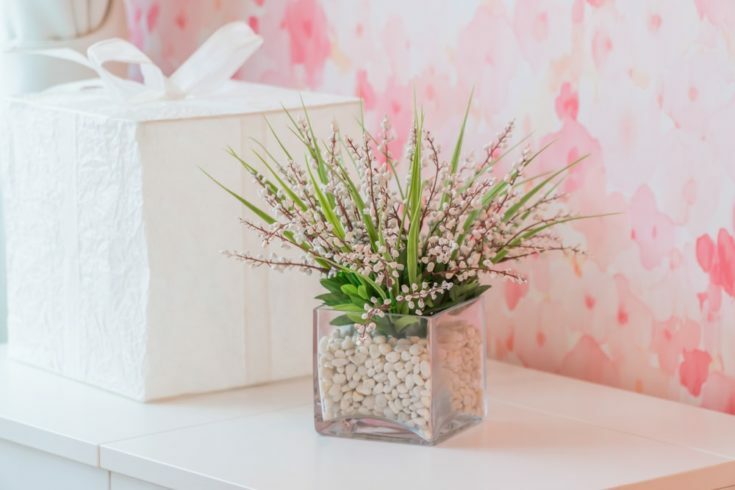 This would make a really cute gift – even for someone who may not remember to water plants since plastic will do just fine instead of real plants! 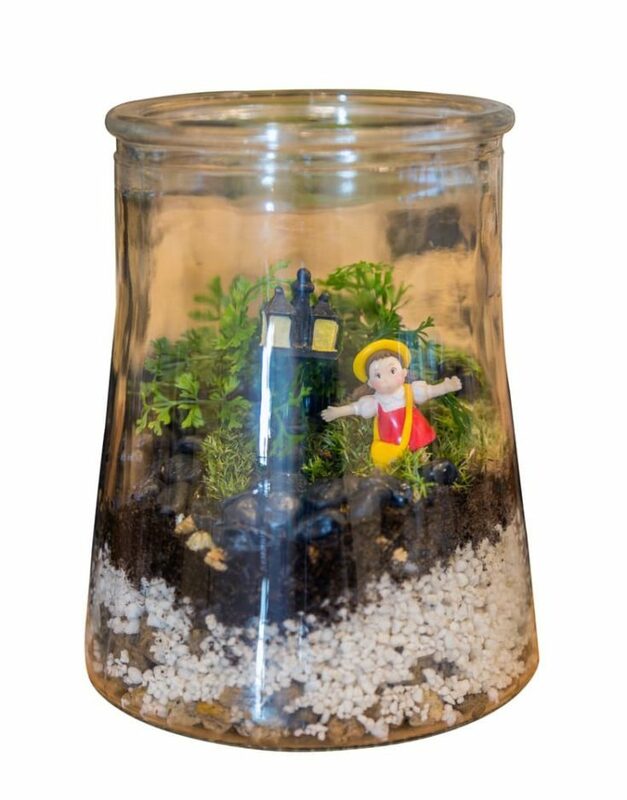 This wide-mouthed jar terrarium features all the best parts of a terrarium, with two special little bonuses. These two adorable white rabbits are whispering to each other in the early morning light, as to not wake you up. This would make an adorable addition to a child’s room if safely kept up and away from tiny hands. This ethereal bubble terrarium comes complete with a living air plant. 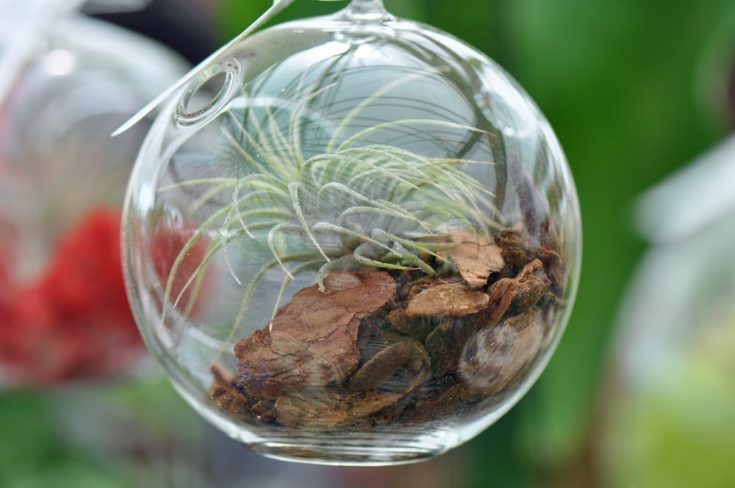 Air plants are super great because you don’t have to water them – really! They absorb all the water they need from the air, so this would make the perfect gift for anyone who often forgets to water their plants. 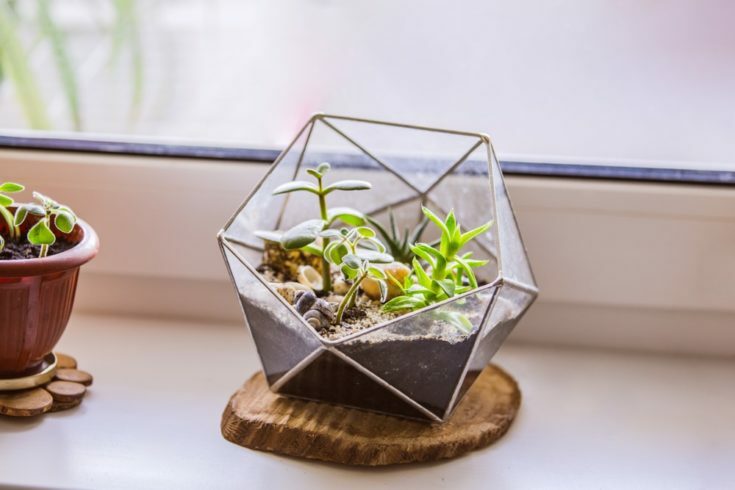 This super easy to construct hexagon terrarium can be the star of the show within your home – especially because you made it yourself! This would also make an incredible gift because, again, you made it yourself! Follow these easy instructions and see just how easy it is to do for yourself. This terrarium is an interesting shape. Its geometrical housing encases a solitary succulent – another plant that does really well without watering all the time. You just need proper lighting for succulents. This would be a perfect addition for a minimalistic house that takes pride in the simpler things in life. 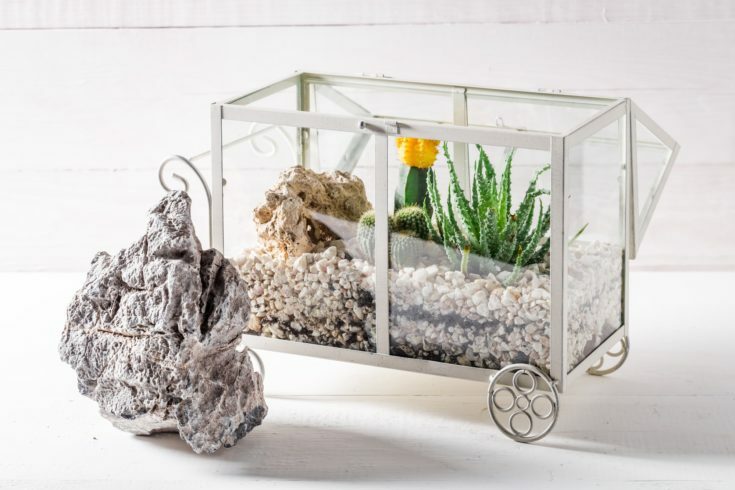 This cactus terrarium is super cute because it houses so many little-potted cactuses. 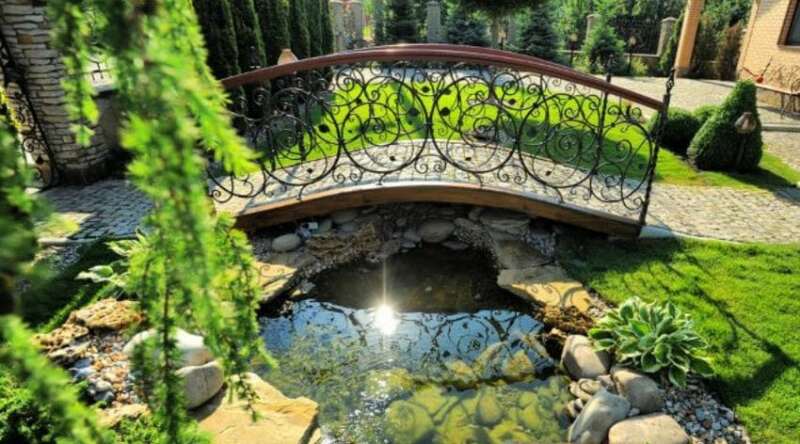 This would make a super cute addition to the patio garden. 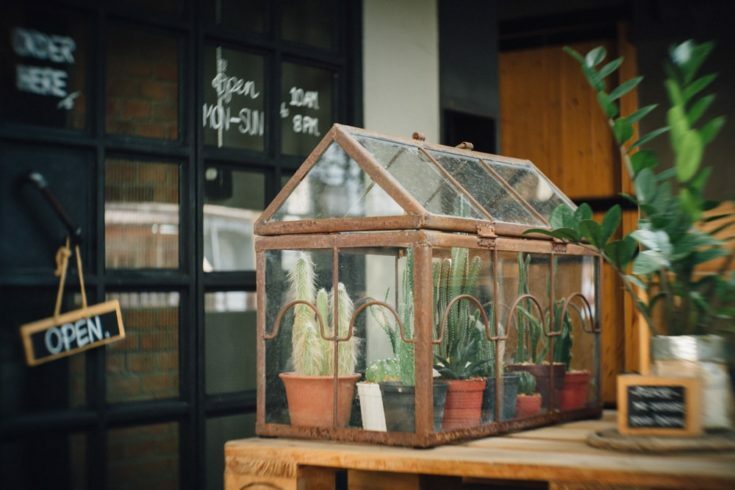 It’s essentially a tiny greenhouse, but even tiny greenhouses are called terrariums since they are basically two of the same sort of thing. 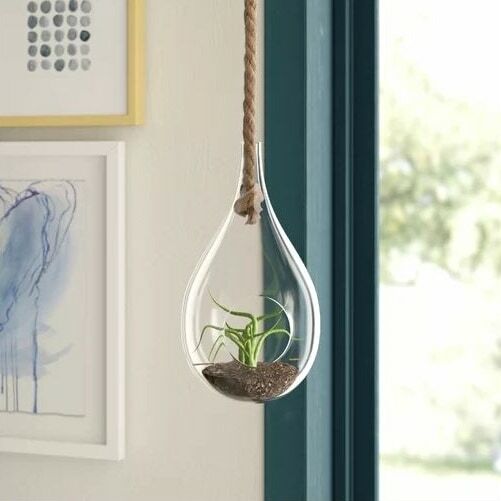 These hanging terrariums are interesting due to their unique shape. This would look great hanging in a kitchen window or even on a garden patio tucked away in the corner. 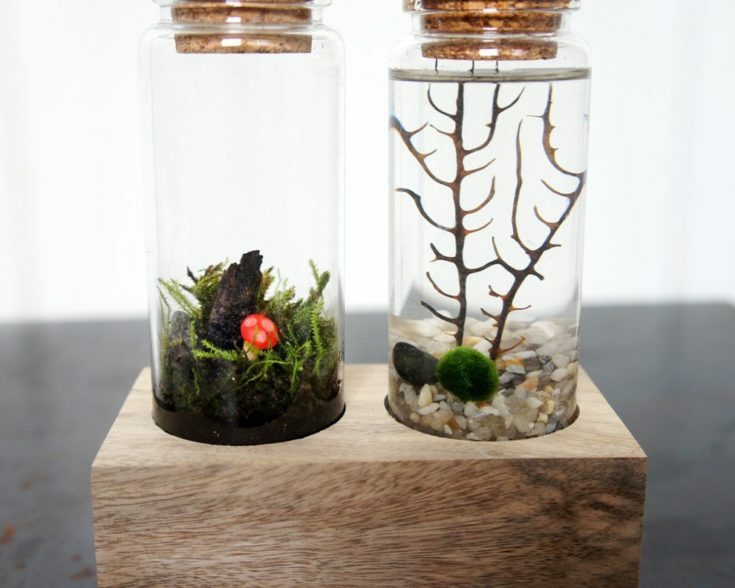 These are smaller terrariums, so, if giving as a gift, you may want to give the set since they look so cute together. 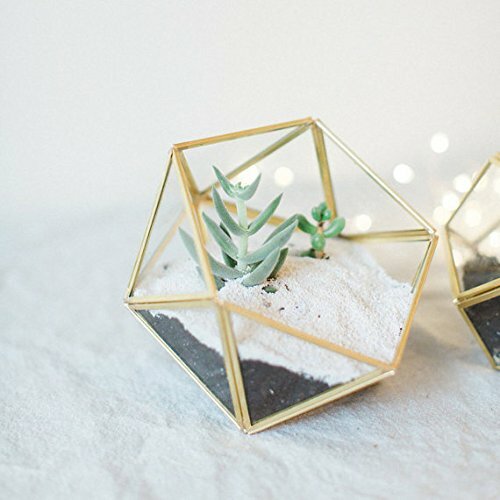 These box terrariums are super cute and definitely interesting to look at. 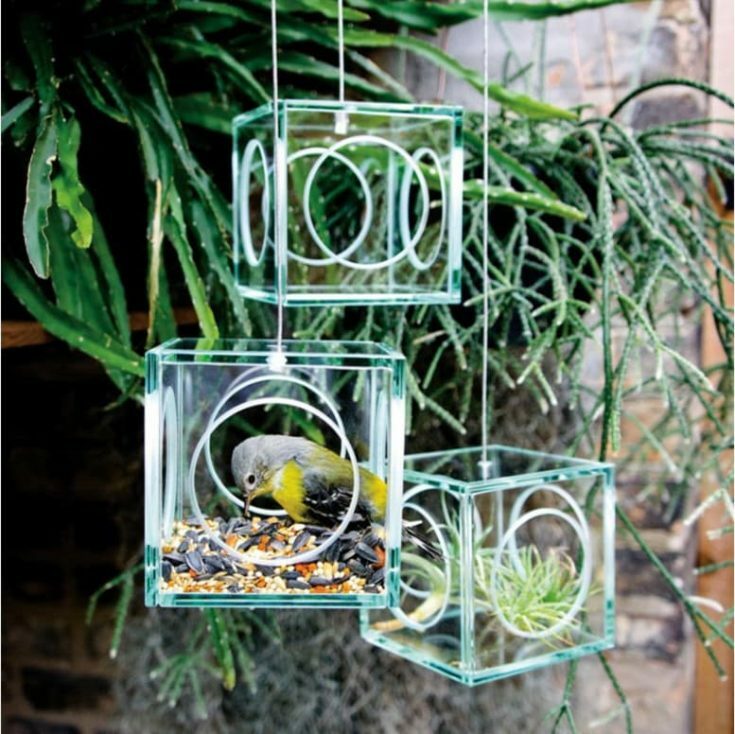 Instead of keeping tiny plants in them, you could make one into a nifty bird feeder, just like it is in the photo. 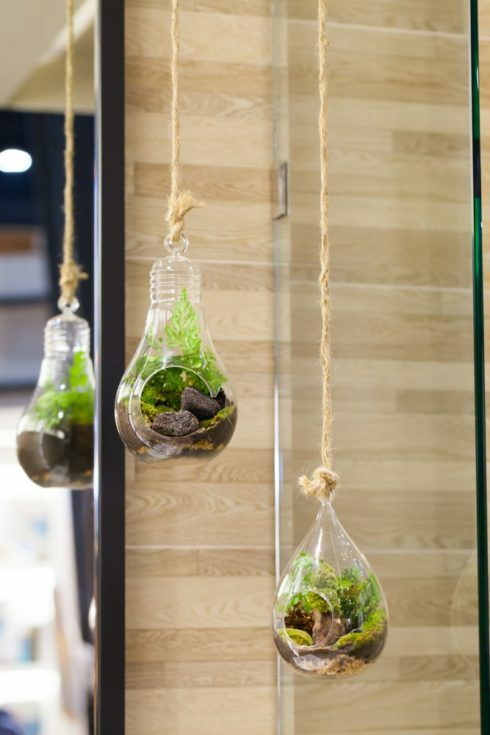 That’s another super cute idea you could pull off with these terrariums. These adorable terrariums are a bit on the smaller side, but they look super elegant with delicate flowers and water to keep them hydrated. This would make a great gift that would look exquisite on a wall or within a garden patio. This is a truly intriguing sight, to be sure. These terrariums look more like planters due to their larger size. This would look super great in a windowsill in a kitchen or maybe even a study or sitting room. Either way, this is a truly stunning scene or these terrariums will definitely bring new life to any room you place them in. 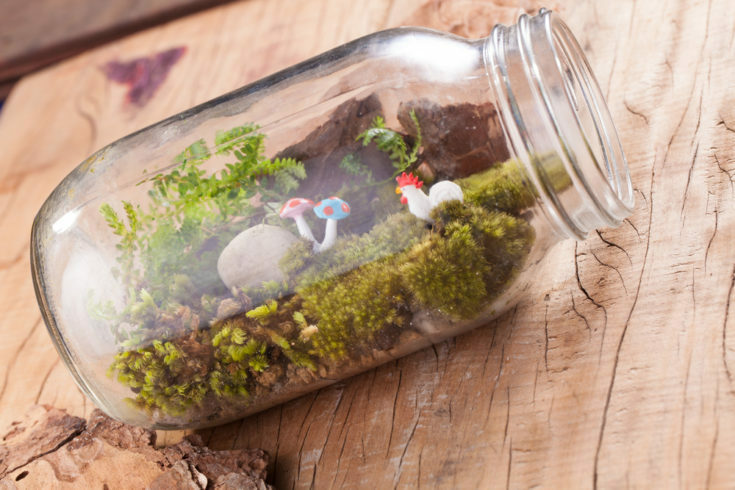 These corked jar terrariums are sitting pretty with these adorable little scenes set inside. This would make a super cute birthday gift or even a housewarming gift. I love that there are two identical terrarium jars, but they are each a bit different inside. 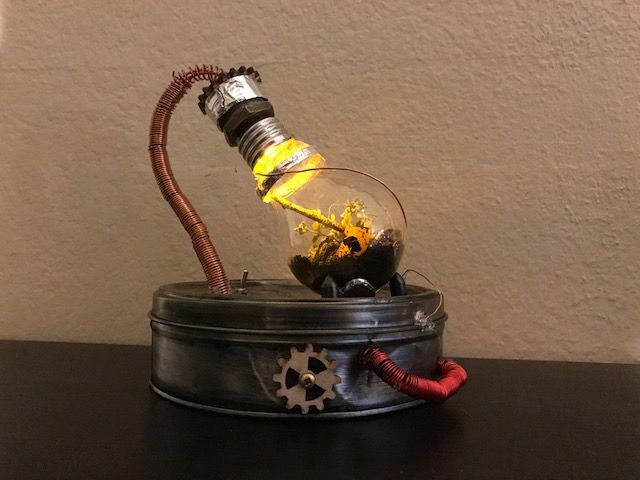 This is a super interesting terrarium that would be perfect for anyone who loves machinery or anyone who is into the more industrial chic sort of décor. 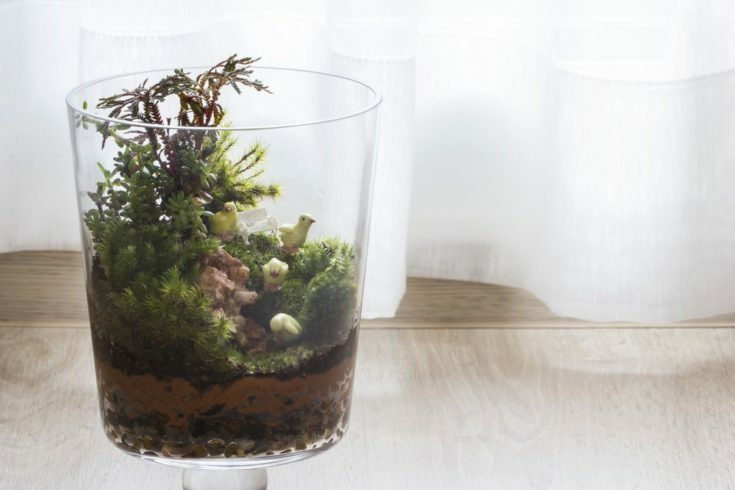 This could also be the perfect terrarium for anyone who appreciates the more minimalistic approach to life. This tiny terrarium is filled with two different colors of sand and a tiny succulent. This is a super cute terrarium that could even double as a paperweight since the sand will keep this little thing in place. This would look really great on a desk or even on a kitchen windowsill. This elegantly suspended terrarium is a super gorgeous addition to any layout. This would look great on its own on a desk or kitchen windowsill, but would also look fantastic in an office, like on a desk or near the coffee pot. 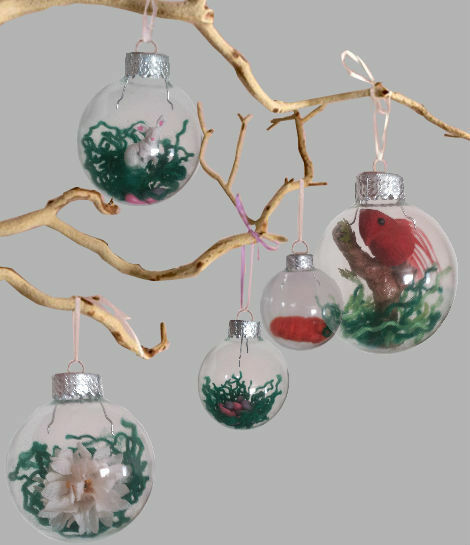 This would also make a perfect gift since this is a bit more delicate than other terrariums we’ve seen. 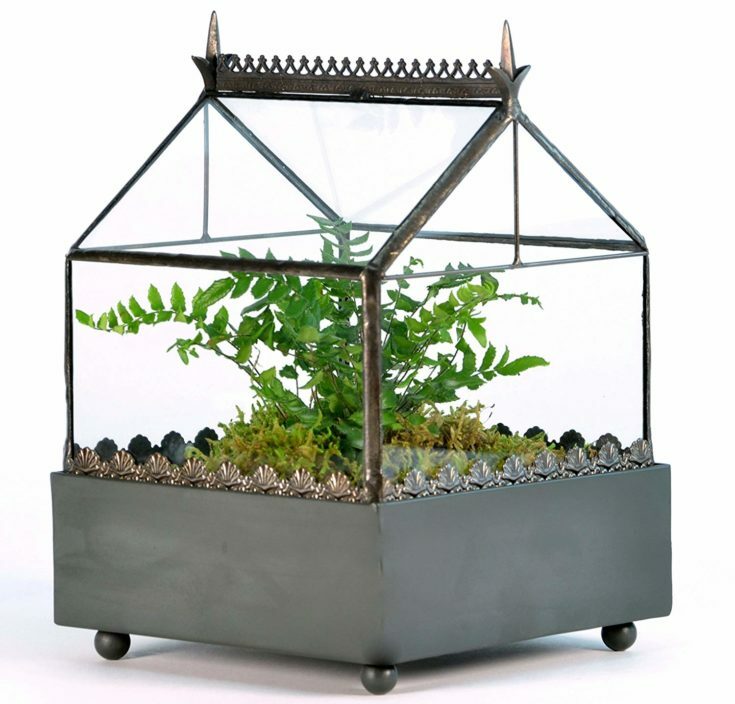 This wheeled terrarium only looks like a carriage from a whimsical fairy-tale. These wheels are more than likely not functional, but it looks super great on this terrarium layout. 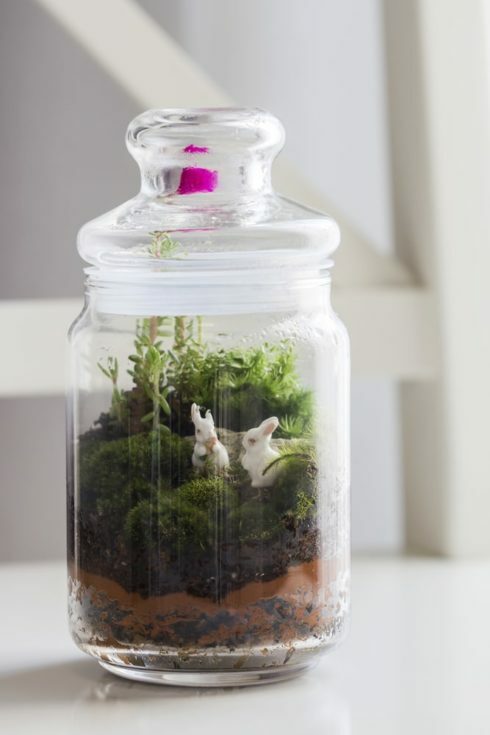 Painted in white, this would be the perfect terrarium to place in a little girl’s room or even in a children’s library. This decorative garden is set within this bubble terrarium that makes it look super delicate. This would look great sitting on a coffee table or even a larger side table within a living room space. This would even make a great do it yourself gift if you send it off with all the things you’d need to fill it. This mossy terrarium looks like the scene from a hillside with that decorative rock and broad-leafed succulent. This would make the perfect decorative item for a work-study desk or maybe even sitting on an enclosed sitting room within a garden. Either way, this is a truly gorgeous terrarium setup. 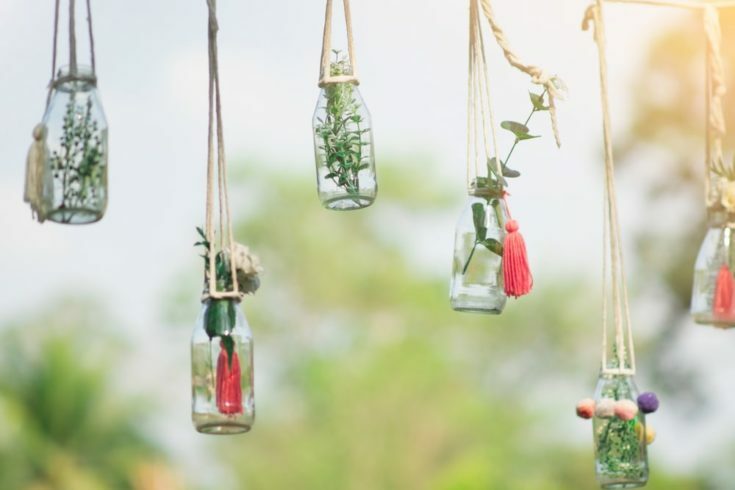 This bottle garden is a super cute way to add some décor to space. 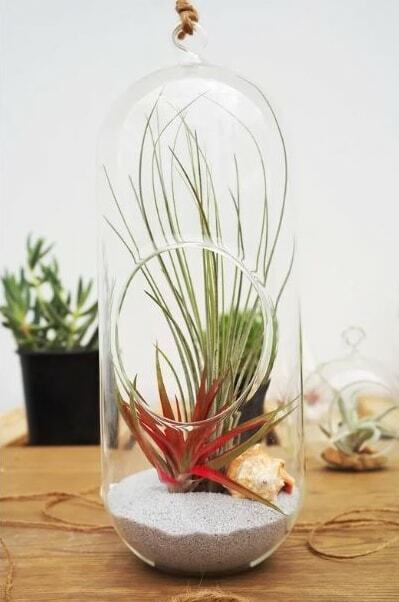 Whether it’s for a child’s room or even an office, bottled terrariums are a cute way to add some life into the room. Whether you prefer a large or smaller terrarium, you can fill each sized jar accordingly. 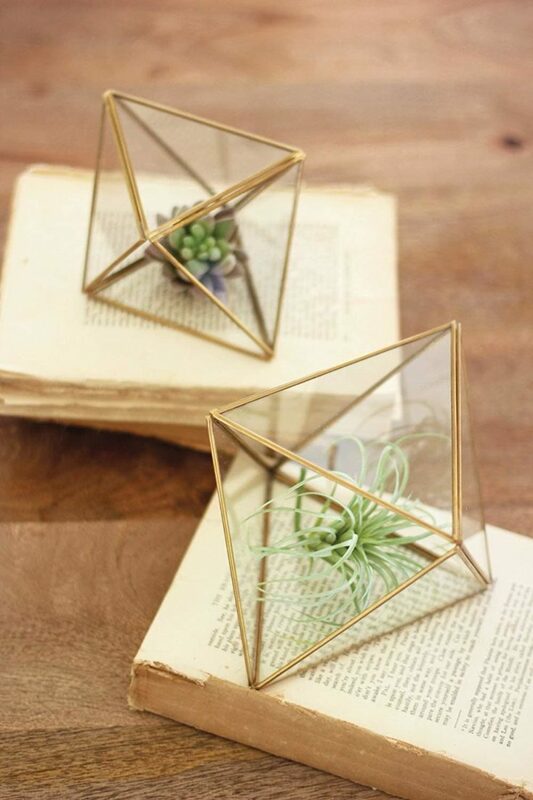 These geometrical terrariums would make the perfect gift for an office or creative space. Fill them with a tiny air plant to add even more alluring elements into the scene. This is a great way to add a little flair into a space that is a smaller area or can’t equip a lot of extra décors. This purple terrarium is a super pretty way to spruce up a terrarium if you want it to match your décor or the décor of a certain room. What’s really great is that it’s so simple to incorporate some colored rocks into the mix to give your terrarium a unique color-scape. This glamorous terrarium is filled with larger rocks and a few succulents. 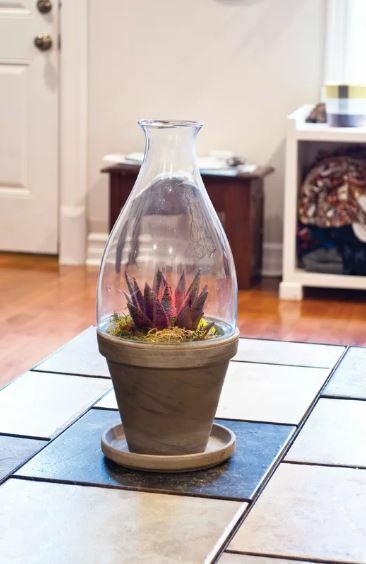 Kind of like the air plants, you don’t need to water succulents too often, but you can mist them with a water spray bottle every once in a while to make sure that they thrive and remain hydrated. 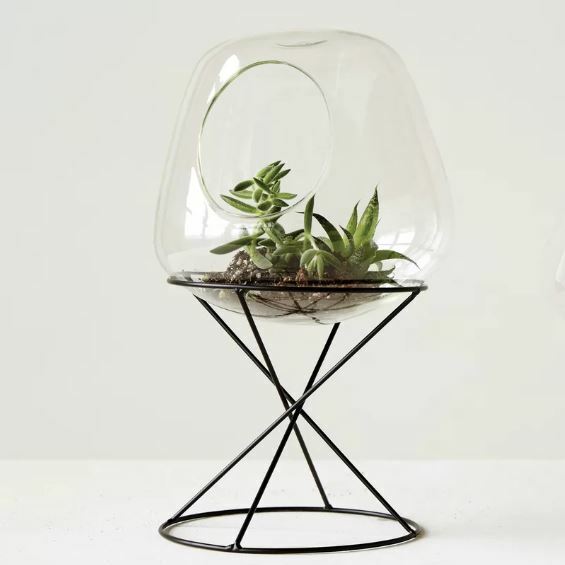 This is a more elegant take on a terrarium and this one comes with a bold stand. This would be perfect for a bathroom or hallway table décor scape since it is truly eye-catching and will draw attention. This would also make a perfect gift since the terrarium already comes in tow with this stand. This is sort of like a terrarium within a terrarium. 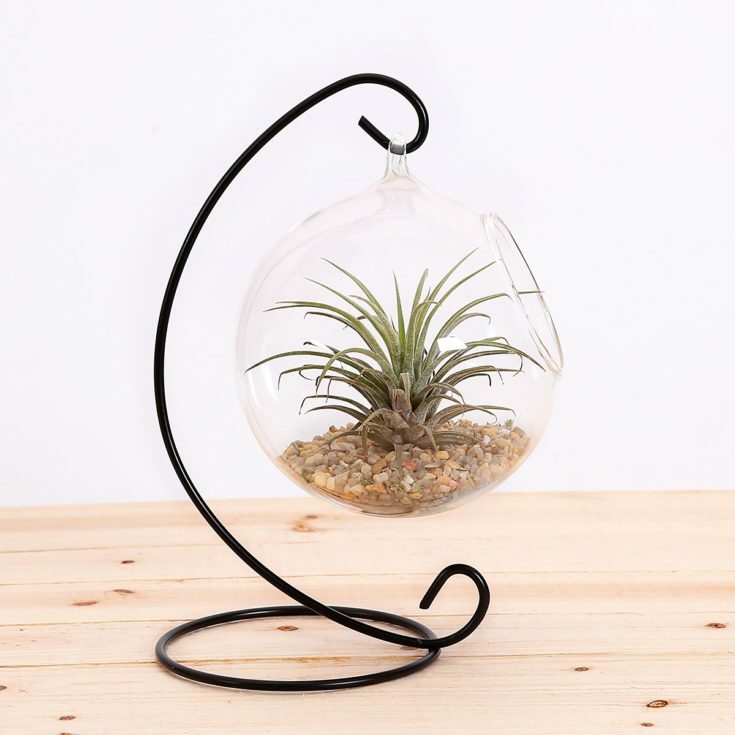 Inside this hanging terrarium is a tiny glass pedestal that is filled with rocks and holds a tiny air plant. 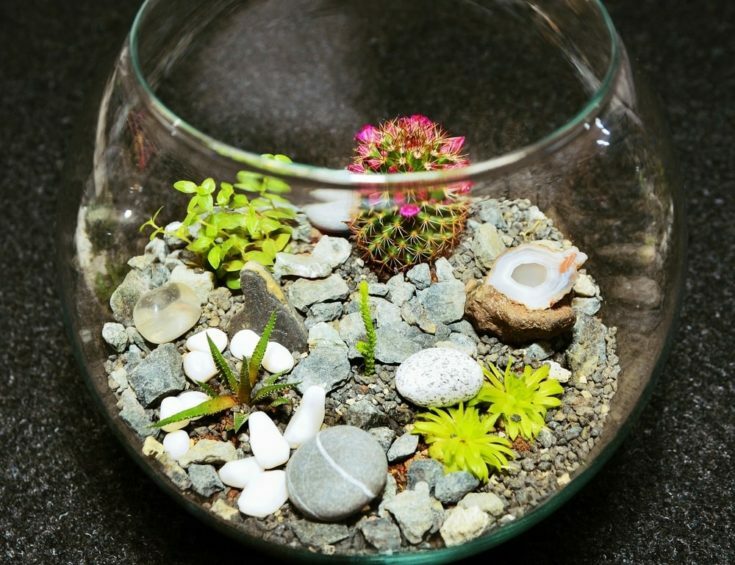 This is a super cute terrarium scape that is sure to catch everyone’s attention. Hang it in a place where everyone can see it and enjoy it. 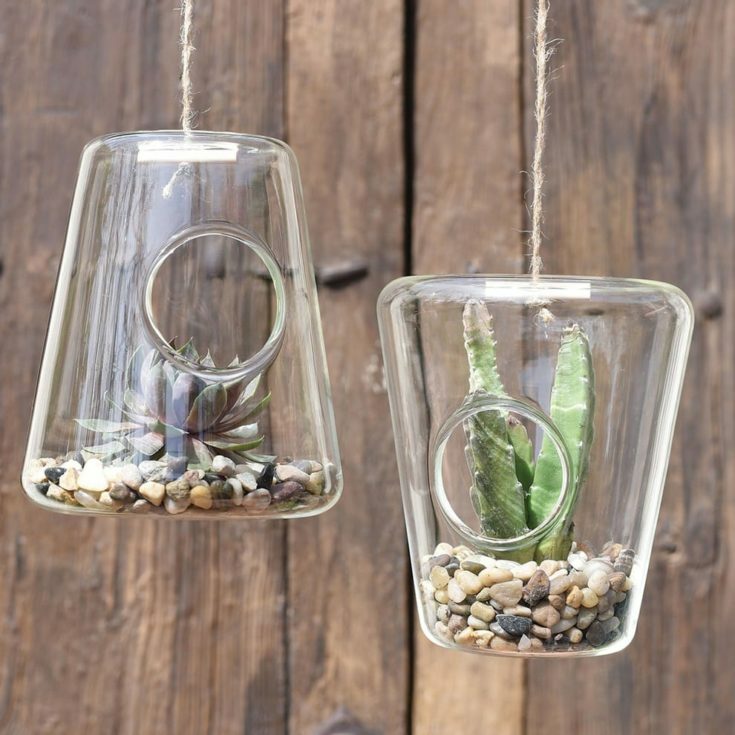 These cup terrariums are super pretty and delicate. These would look really great scattered along a coffee table or even strewn about a bathroom sink top for some extra décor. 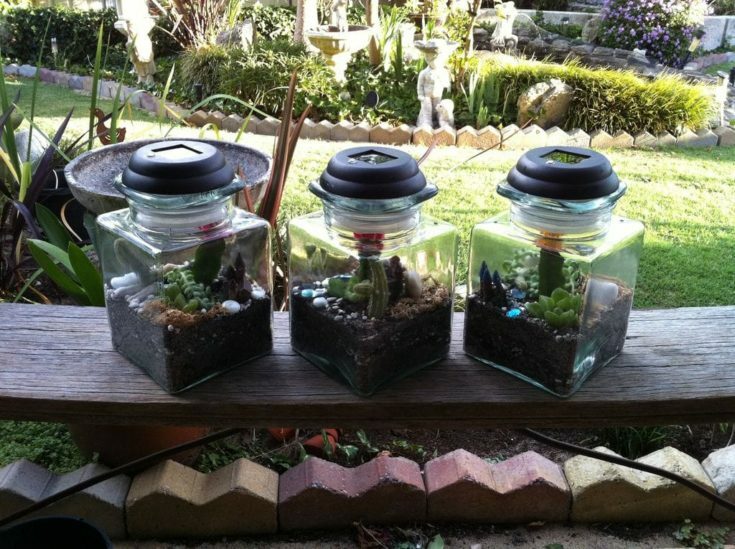 Fill these little terrariums with colored rocks or glass pieces to create a colorful scene. This tiny glass terrarium with feet is a super cute take on a classic terrarium. This would make a good companion to a desk filled with classic books or even nestled quietly upon a bookshelf. 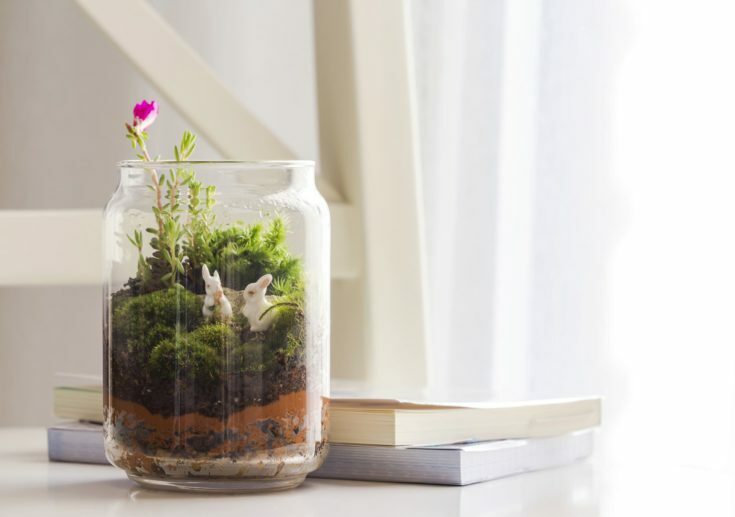 The tiny little feet in this terrarium add an extra element of charm, making it a perfect gift. This glass terrarium comes complete with a glass stand. This is a super cute gift idea that is a bit more elegant all thanks to that tiny glass stand. It’s the little additions that make all the difference, after all. This terrarium would make a great Christmas gift or even a birthday gift. 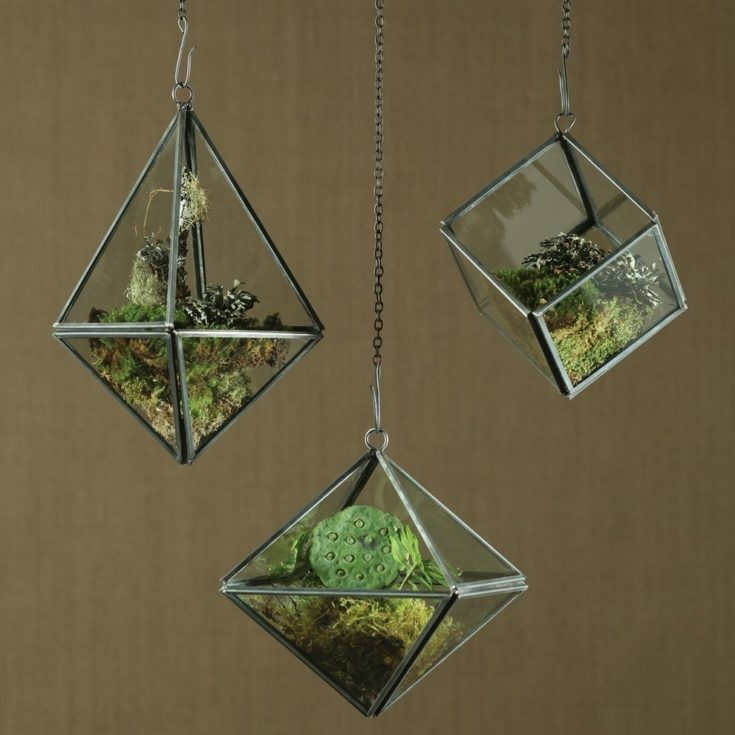 These gem shaped terrariums are super pretty and would make the perfect gift. These three go well together and should be kept together when it comes to gifting them. Being a bit more elaborate gift, this would make a good present for an extra special occasion. 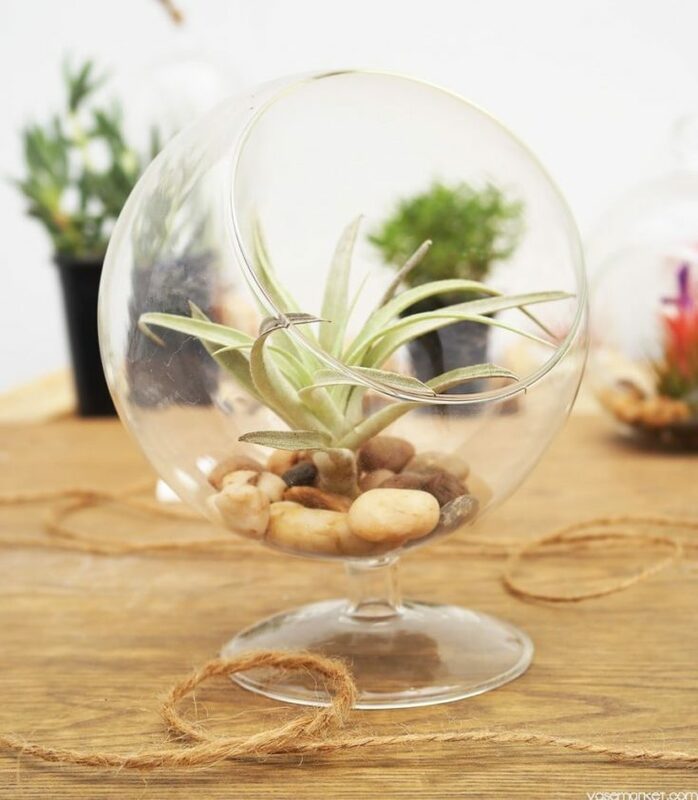 So, you don’t always need a thin glass bauble to create your very own terrarium. 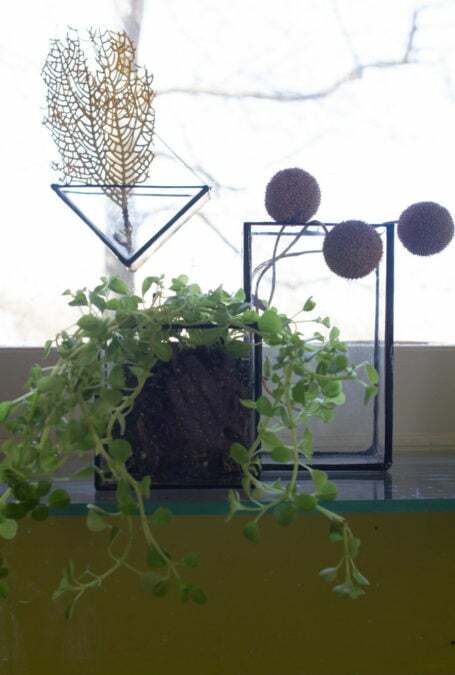 In this glass, most commonly used as a whiskey glass, the thicker bottom makes for a perfect setting for a terrarium since the heavier bottom will keep this glass in place. 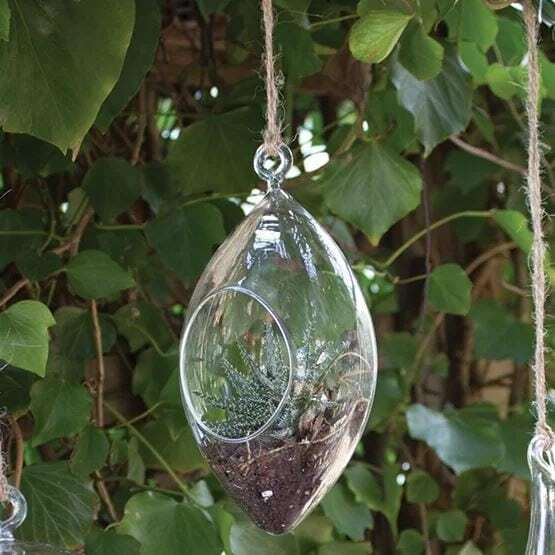 These teardrop glass terrariums make a super cute sight to see and would look especially great within a garden setting. 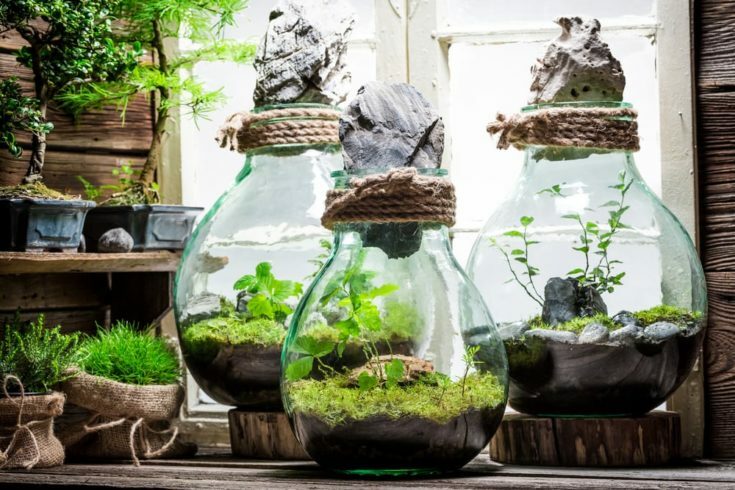 By making sure these tiny terrariums are fastened securely, you could easily hang these from a tree within a garden space to add a little décor to it. These little terrariums filled with water make a really interesting sight to see. The delicate plants housed within these terrariums will stay hydrated and will thrive from all the water they are giving. It’s also just interesting to see these exposed roots sucking in the water while hanging there. 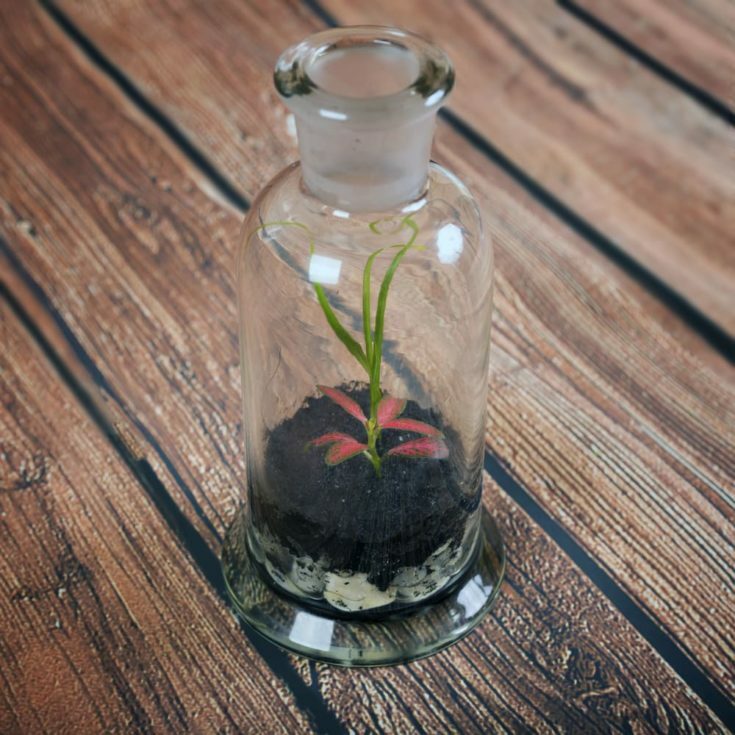 Instead of a ship in a bottle, why not create a unique atmosphere with a terrarium in a bottle? 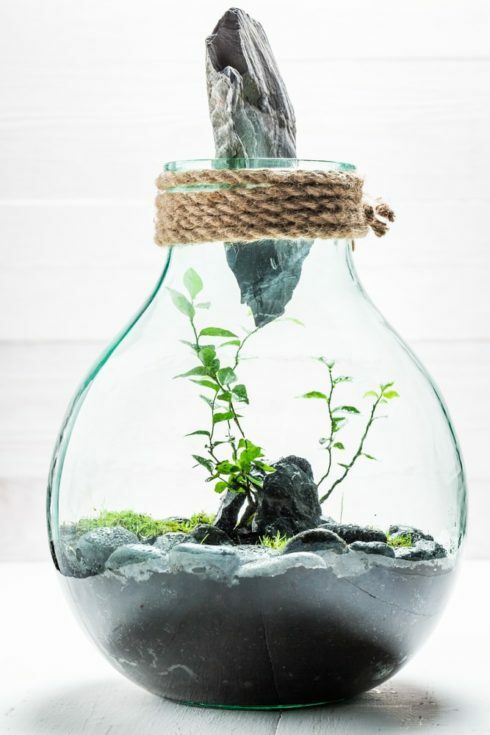 This sideways jar makes the perfect housing for a delicate terrarium setting and comes complete with rocks, plants, and moss to create an interesting space. These DIY square bottle terrariums sit pretty on this deck railing, filled with interesting plants and rocks to keep the jars weighed down. 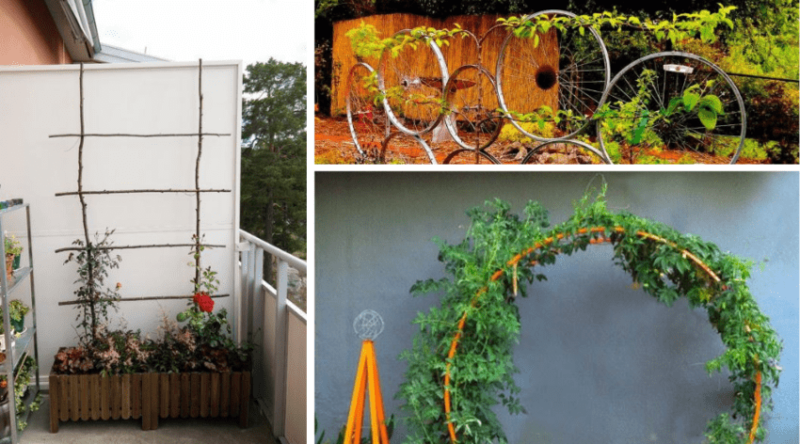 This would be a fun project to execute with the kids or even as a Girl Scout project or nature center project to learn about the way plants and rocks work in conjunction. 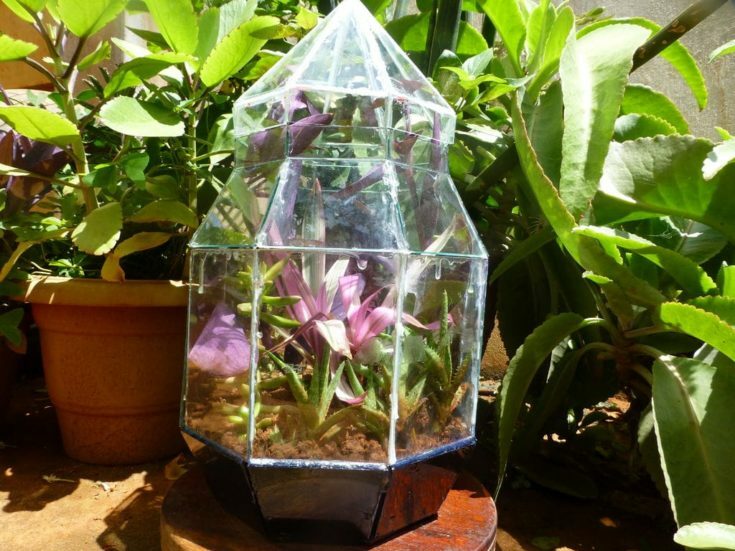 This garden stand terrarium is a really pretty addition to a garden area. This would make an interesting conversation piece or even a decorative element for as soon as you exit the house onto a garden patio. Use these at your next party to create some intriguing spaces and watch the conversations start. These glass bulb terrariums are super interesting to look at and would look great in a room where there are lots of suns so that they can glint in the sunlight. These would also make awesome gifts since they are unusual and it’s probably rare that anyone has seen them before. This vase terrarium is super pretty because it’s a bit larger and wider than most of the other terrariums we’ve seen. You could easily find one of these containers at any hobby store and then fill it with the things that you want to see inside of it. Personalizing it is super simple. 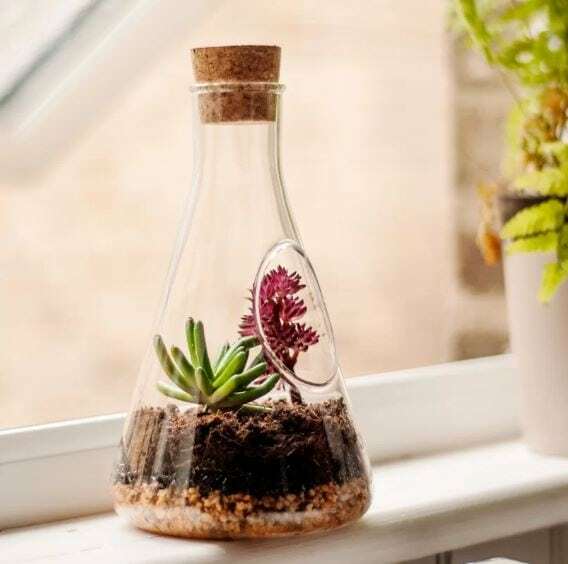 Perfect for the chemist or biologist in the family, this corked flask bottle makes the perfect terrarium. The hole in the center allows you to fill the terrarium with anything you’d like to make it perfect for your room you plan to put it in. Use several of these to add more to the area. 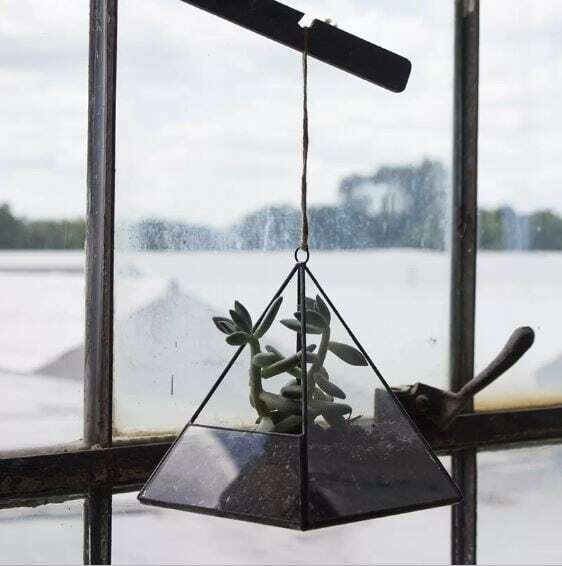 This hanging pyramid terrarium looks mystical hanging in this window like this. This would make a good decorative item for the outside of a house or maybe even a cottage in the woods. It’s important to make sure that this piece is in an area where there isn’t too much wind to prevent it from falling. 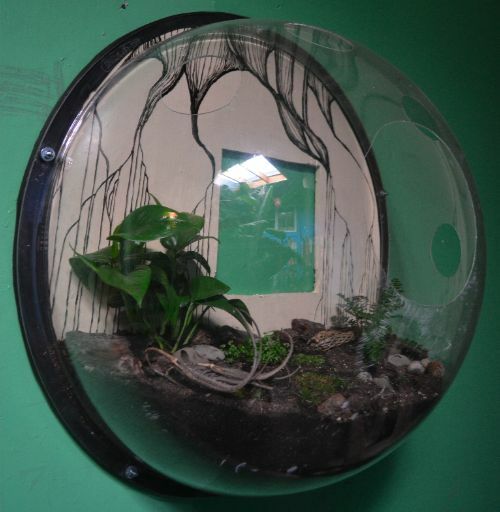 This wall terrarium is a perfect piece to add some intrigue into space. Whether you have a hallway that could use some extra décor or even a bedroom that you want to add some plant life into, this terrarium is an interesting way to do it. I like the bubbled outlook on this one. 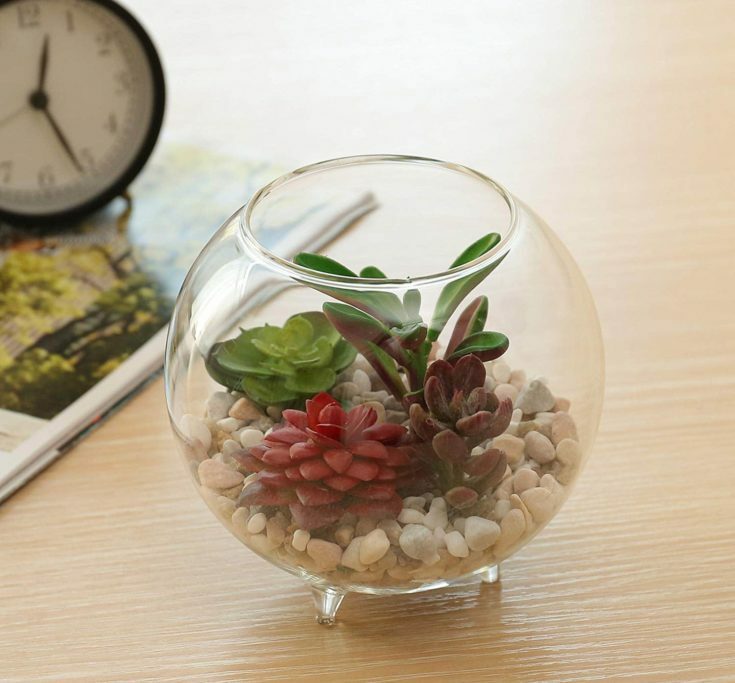 This tiny bubble terrarium is the cutest way to incorporate a terrarium into the mix. It’s very small shape will only add to the delicate nature of this terrarium. This would make a cute addition to any porch or area where a little extra intrigue is needed. 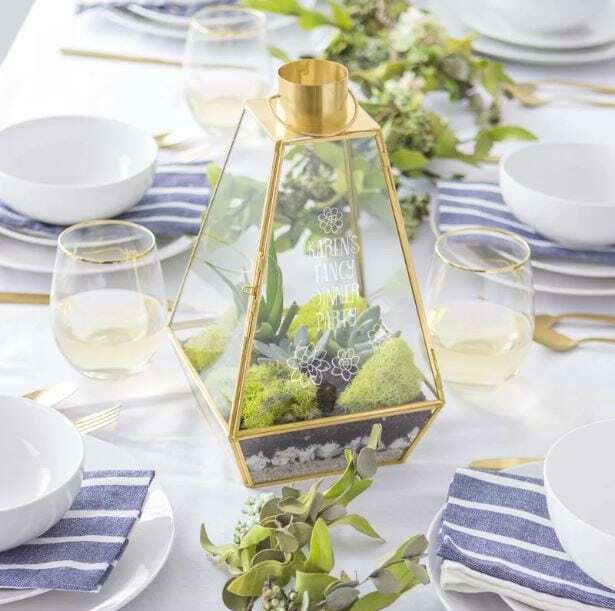 This lamp terrarium makes this tabletop pop with intrigue and life. This would make a really cute sitting at a dinner table during a fancy meal or special occasion. 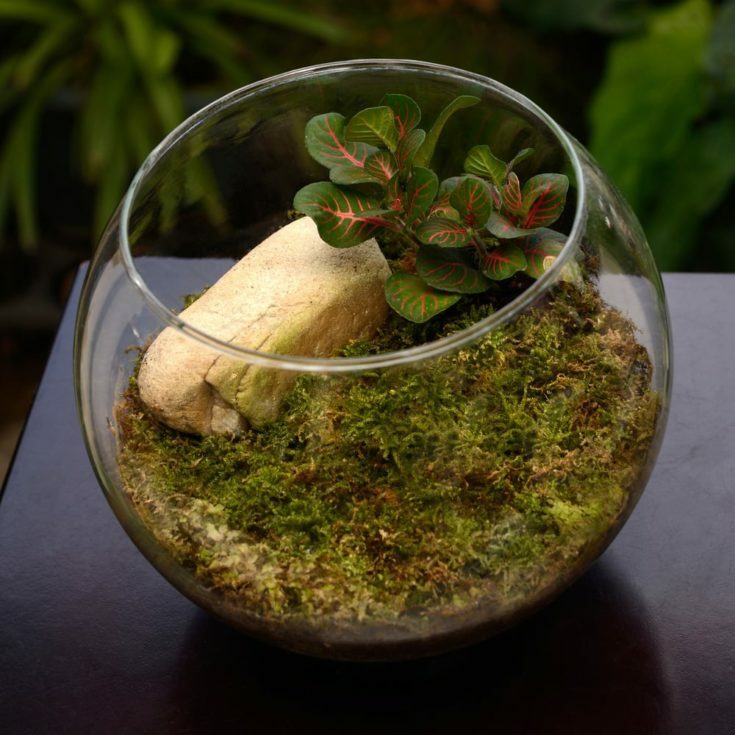 Whether you are entertaining or just want to add a little something extra nice, this terrarium is perfect for the job. 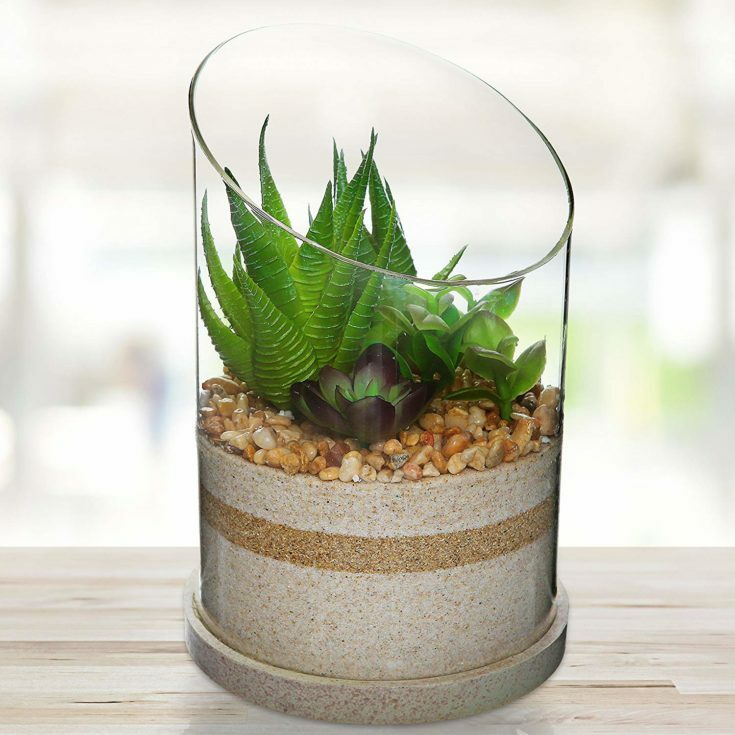 This elongated terrarium is super neat because you can easily fit a larger plant into it. If you use an air plant, you won’t have to worry about watering it often since the air plant will get its water from the air. You could also use a plastic plant or flowers and not worry about it at all. 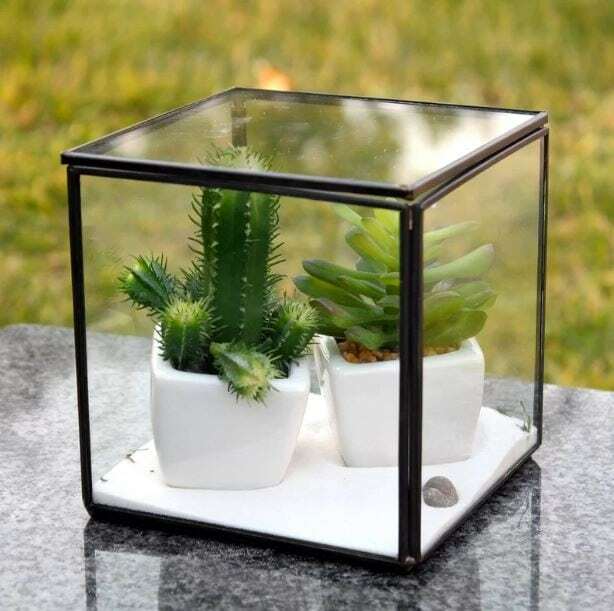 This box terrarium is a super cute way to add some interesting elements to the decorating process. 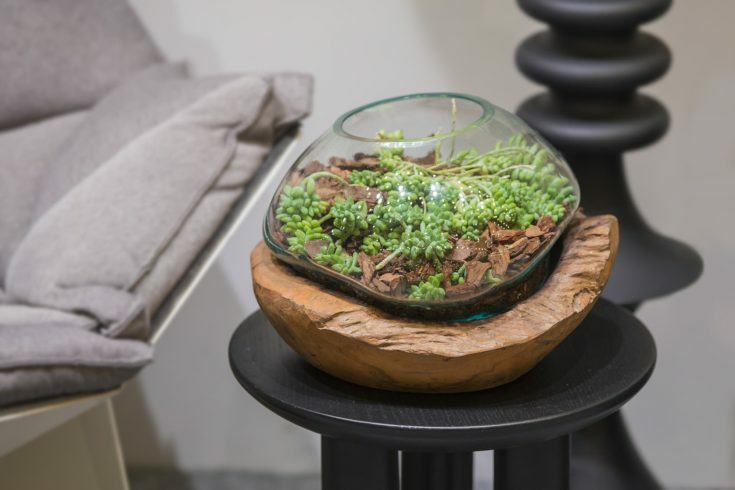 Whether you have a coffee table that needs a little something extra or you just want to add to an already interesting space, you can’t go wrong with this cute little terrarium. This outdoor terrarium is a super cute way to add some more plants around. After all, you can never have too many plants. This interesting shape of this terrarium only adds to the charm of the size of this terrarium. Fill this one up with some interesting smaller plants. This terrarium almost looks like a tiny house. A tiny house that is filled with interesting plants. This is a super cute idea that will definitely draw in the charm from anyone who visits your home. This would look great on a patio table or an indoor coffee table. 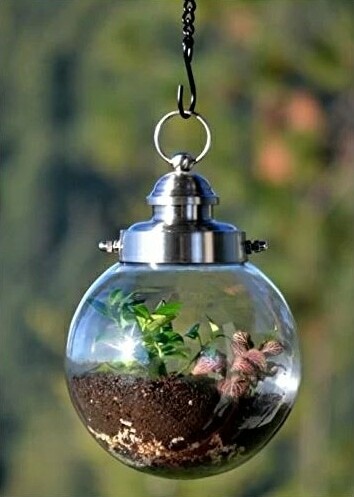 This whimsical little terrarium looks like you’ve peeked inside the home of a fairy or gnome. 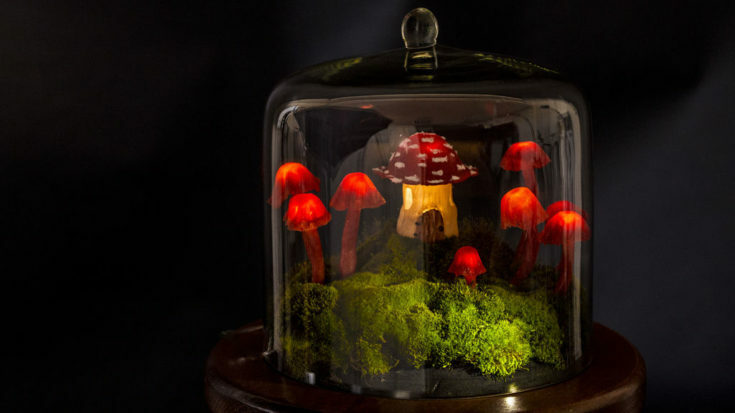 The tiny mushrooms are fake, obviously, but this is super cute because of this terrarium doubles as a lamp. A very dim lamp, but still a lamp that is sure to draw in the charm. Speaking of lamp terrariums, this steampunk take on a terrarium is a super interesting way to add a terrarium into the mix. 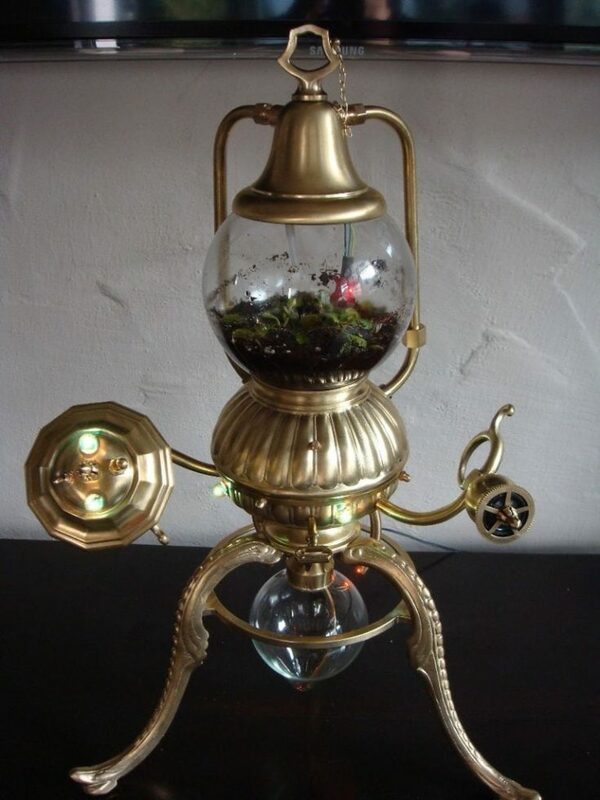 This almost looks like an interesting lamp, but really, the small bubble at the top is a tiny terrarium. This would make a really cool gift since it looks so awesome. 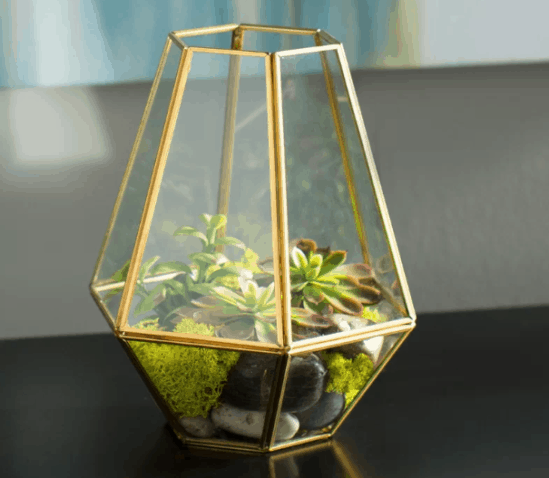 This rock terrarium is super pretty. It almost looks like its own universe floating atop a rock and you’ve just happened to stumble upon it. The glass itself almost looks like it just landed there like a giant bubble. This would make a great terrarium for a covered patio area. This flowery terrarium has gorgeous little blooms and plenty of elongated plant leaves to make this a truly interesting decorative concept. 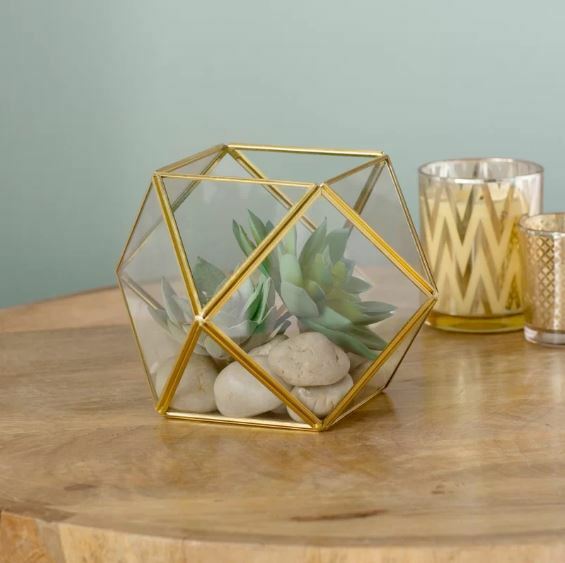 The square glass vase to this terrarium is really pretty and it would make a great piece to add to a side table area or even on a kitchen dining nook. 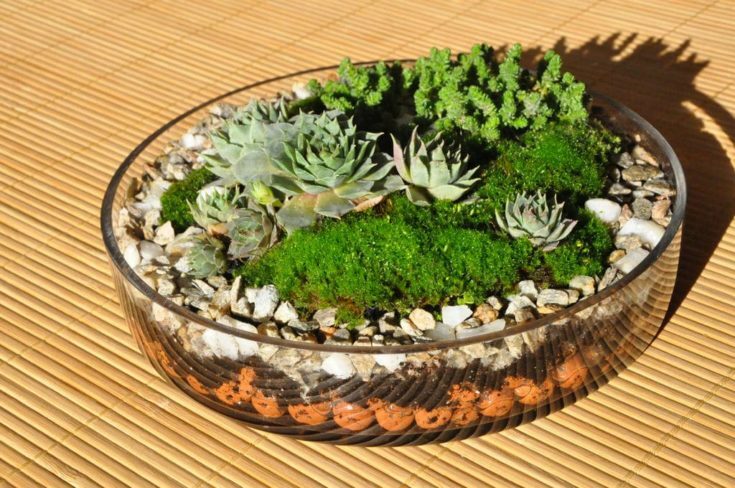 This large, flat terrarium bowl features plenty of rocks and succulents to keep this interesting. This is basically like a tiny garden all in its own in the compact version of a terrarium. You can personalize this to make it as interesting as you like, but it’s already adorable on its own. 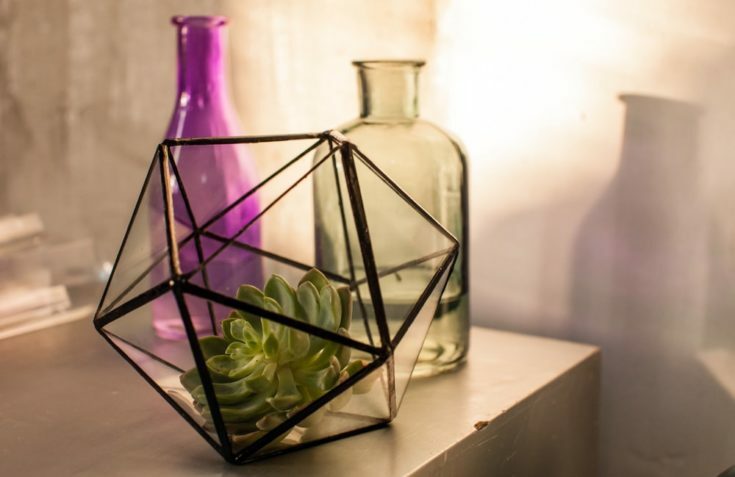 Sitting pretty with this geometrically shaped terrarium, this one is super posh and ready to be shown off. This would look great in a smaller apartment or even a loft somewhere in a city. You can add fake plants into the terrarium, but incorporating real ones would go that extra mile. 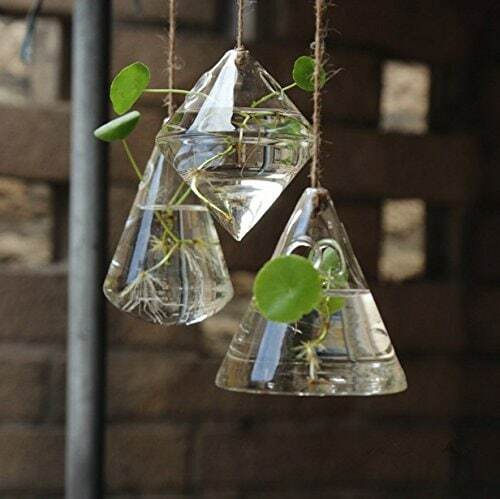 These tiny glass vase terrariums look super cute hanging from this tree and you could easily execute the same thing in your own home or apartment. I love how tiny these are because you can stick in just one little plant that will fit into these. Super cute and interesting to look at. This bulb terrarium comes complete with a rock cork to make this whole thing look rustic and intriguing. 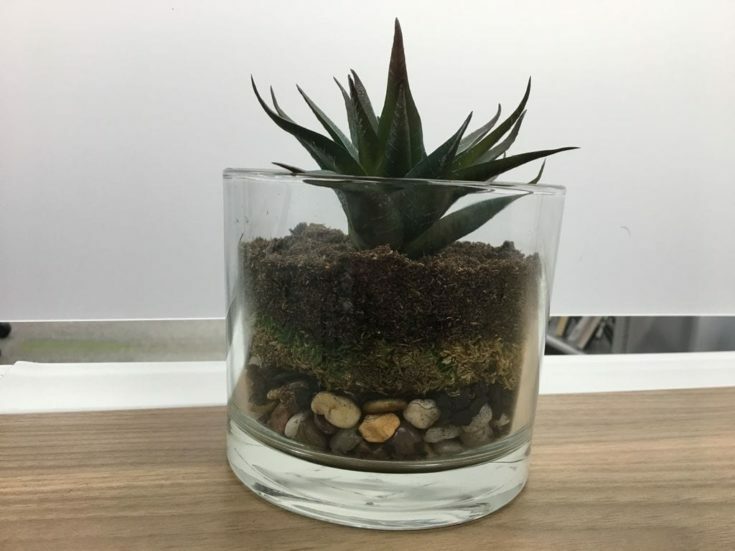 Whether you need to find a last minute gift or you just want to incorporate something really interesting in the garden, this is the perfect terrarium for the job. You wouldn’t think to save some old Christmas ornaments from Christmas to make your own spring terrariums, but look at what a great idea it is! 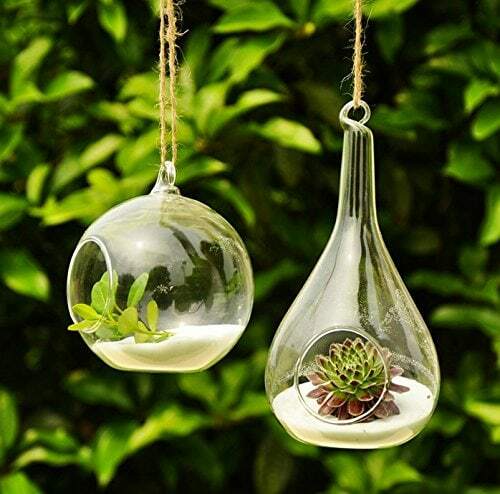 These little orb terrariums could easily be hung around the house for some extra décor or even strung together with some lights for a garden party. This little girl terrarium is a cute gift idea since you can personalize it. Give it away as a birthday gift for a little girl who loves to go for long strolls in the woods or even make it for your own child. 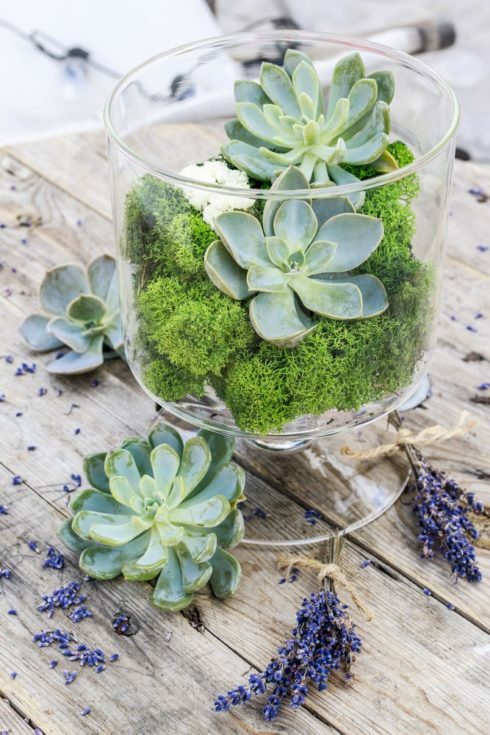 Whatever the occasion, this terrarium is sure to be a crowd pleaser. This prismatic terrarium looks super great and would look even better under some fluorescent lights. This would look great on a kitchen bar area or even near a sink area that has some great lighting to show it off. The shape here is also really interring to look at. 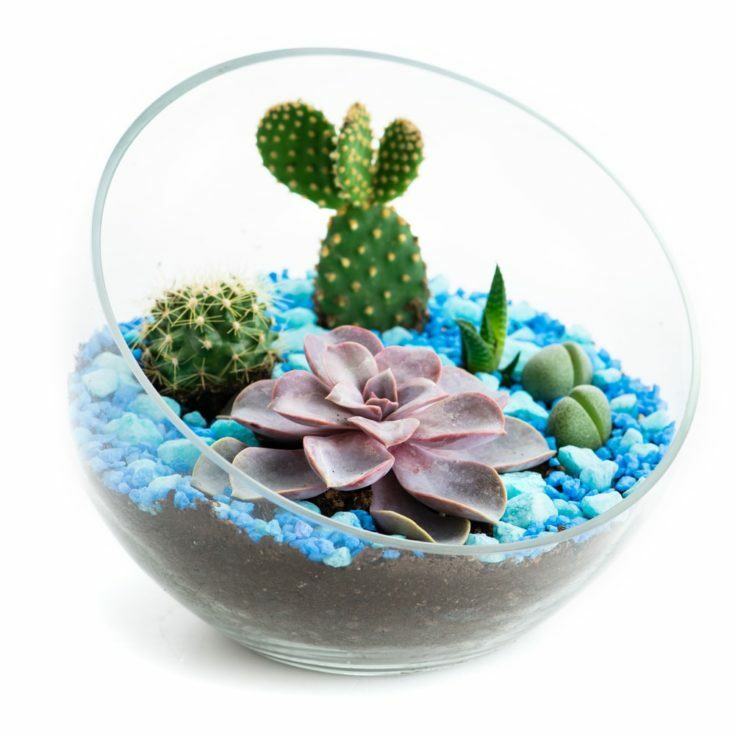 This cactus terrarium is super cute because it’s flatter, wider bowl that will show off all your interesting cactuses or succulents. 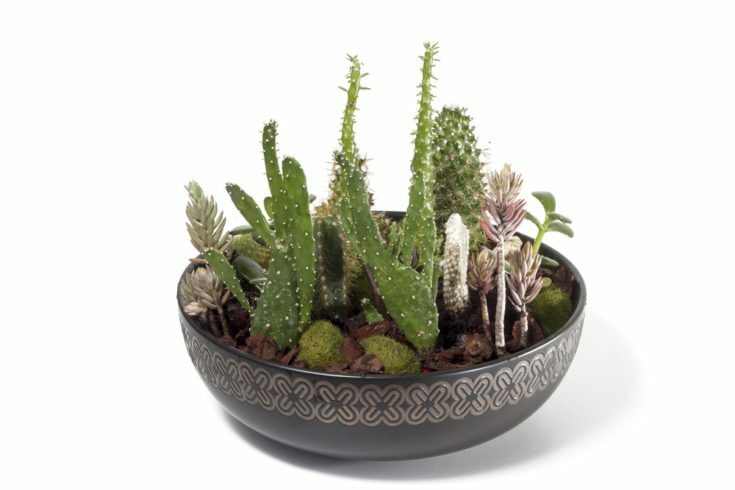 You could even mix some cactuses and succulents into the bowl to create an intriguing space. This would look great on a desk surface. This is a crisp and clean design for a terrarium idea. 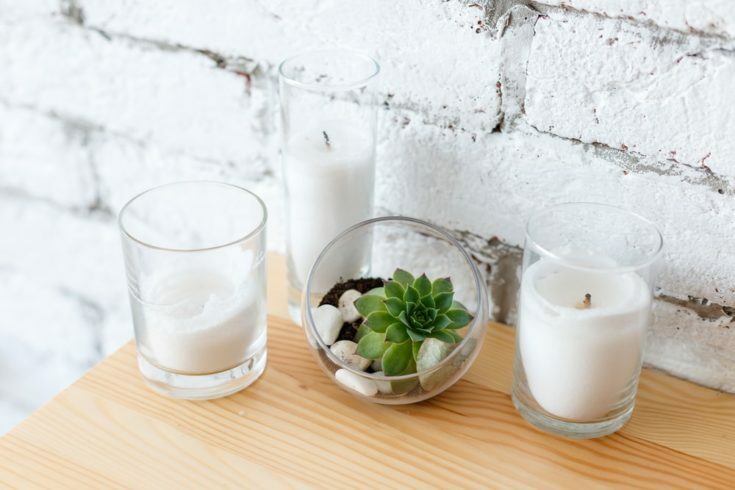 The pure white candles paired with this tiny terrarium make a super great décor scheme that would look really great in a bathroom or even in a kitchen area where it will get plenty of light and attention. This terrarium has blue rocks that make it look super fun and intriguing. 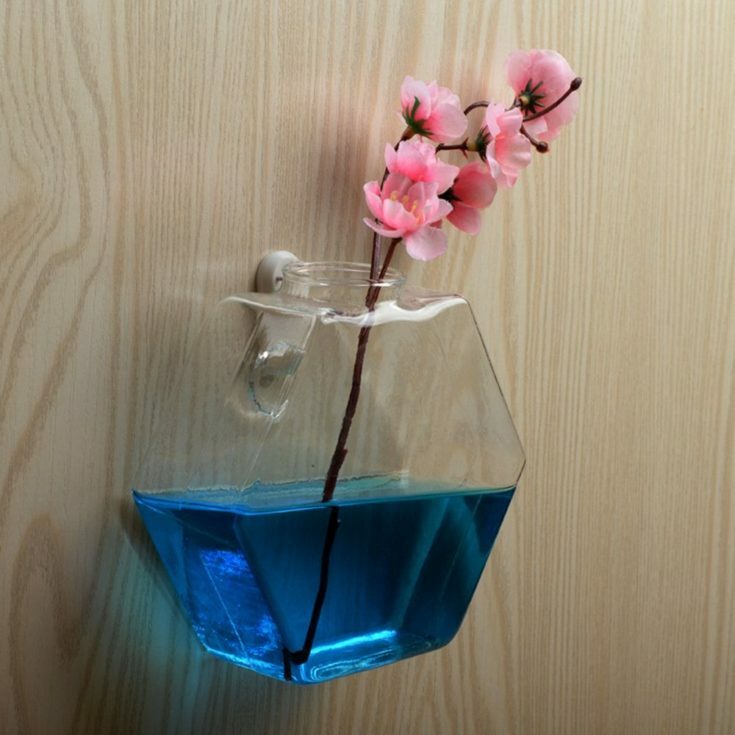 This would be the perfect addition to a bathroom that needs a pop of color or even a kitchen nook. 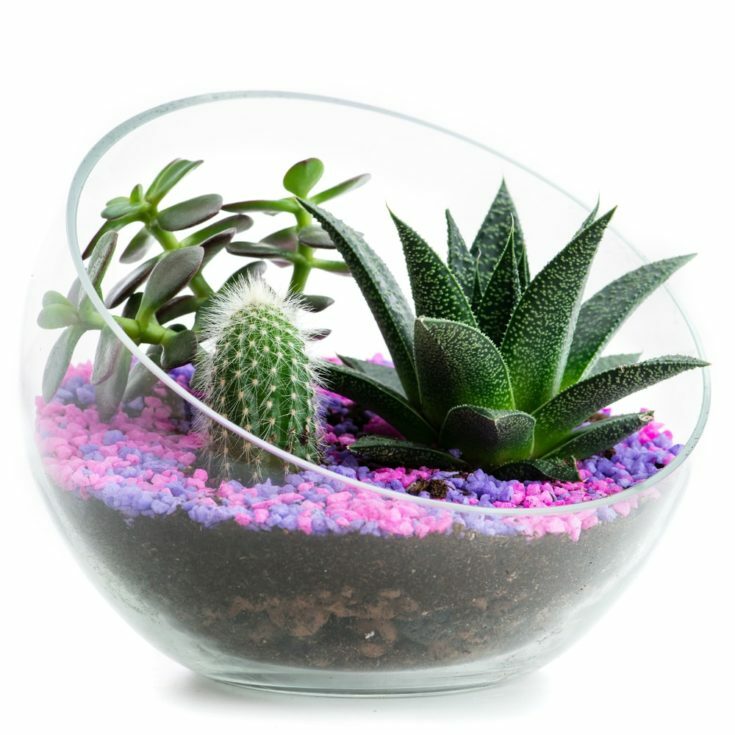 You can easily personalize this terrarium by adding any color of rocks that you’d prefer. 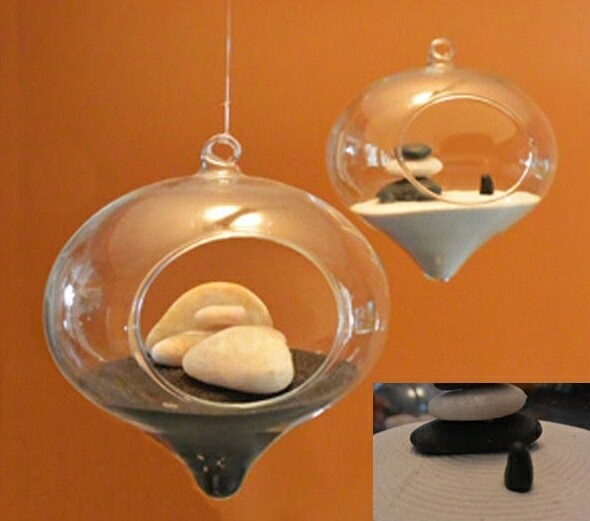 These rock garden terrariums are a super cute way to do something different with a terrarium. These tiny rock gardens are filled with sand and tiny rocks to create a more Zen space that is sure to be intriguing to your guests. Don’t be surprised if you get compliments on these. These small bottle terrariums are super cute and look really great clustered together like this. These would make a really cute gift because they are smaller and you could fill them with all kinds of different plants or flowers. Put these in the corner of the living room for more attention. This clustered terrarium is just a bunch of different plants bunched together to make this gorgeous sight. 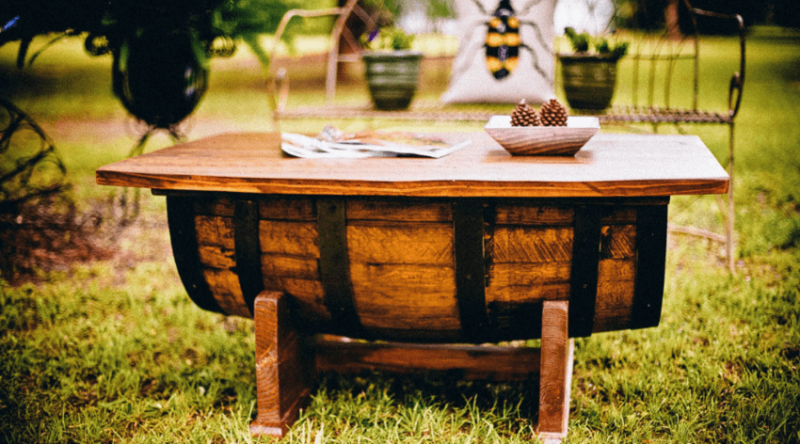 This would be the perfect addition for a dining room table or a kitchen table where you can have brunch with the family and enjoy the scenery. These terrarium bottles are a super cute way to add some cuteness into space. This could easily become a cool DIY project too, especially if you’re looking for a fun project to do with the kids. The best part is you can easily refurbish old bottles laying around to create something new. 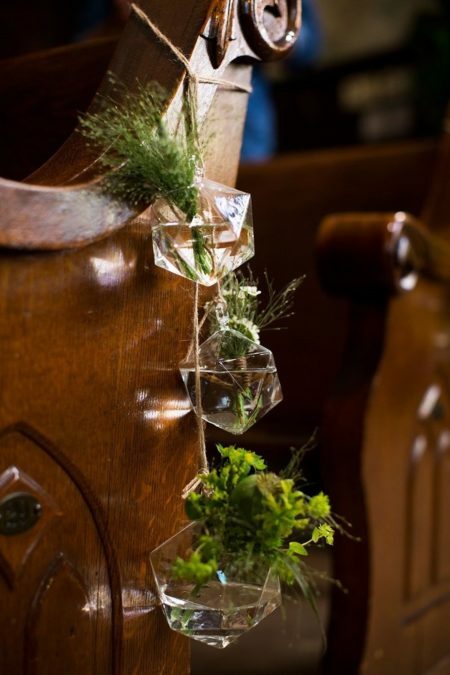 This dried flowers terrarium is a neat way to add some flowers into the mix. 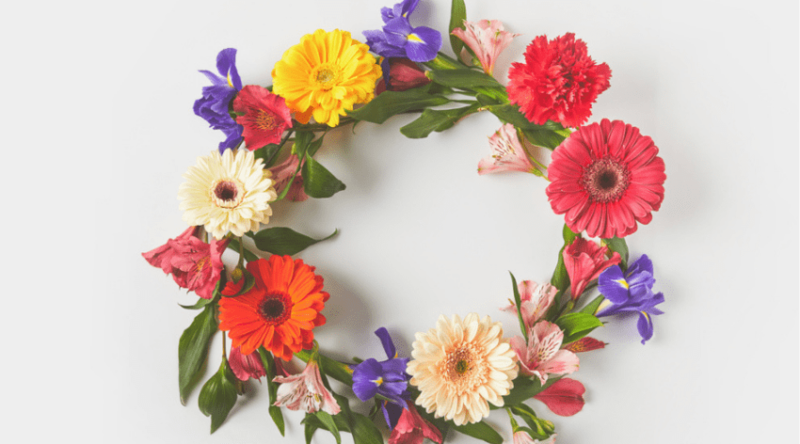 Dried flowers can actually make for some really pretty decorations, but they can collect some dust if you don’t clean them often. I like this concept for a terrarium because it’s different from cactuses or succulents. This potted terrarium is super cute because it mixes the cuteness of a potted plant with a terrarium, creating a more elegant look. This would look great on a table where there is plenty of sun so the plant can thrive. You can also remove the glass part and switch out the plant. 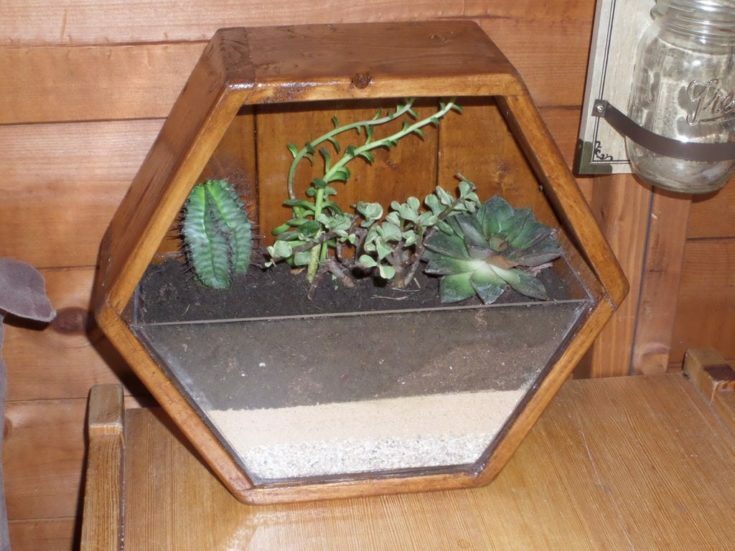 This sand terrarium is super pretty because it incorporates the interesting patterns of sand. You can easily mix this up by adding a layer of colored rocks to add some more texture into the terrarium. You can also keep all kinds of plants in here that have roots such as ferns. This is such a pretty concept and I don’t know why, but I think this would look really great in a bathroom or kitchen area. The plant looks really elegant sitting in this water and this would make truly delicate incorporation to any kind of setting. So there you have it! Some of the best small terrarium ideas that we could find! 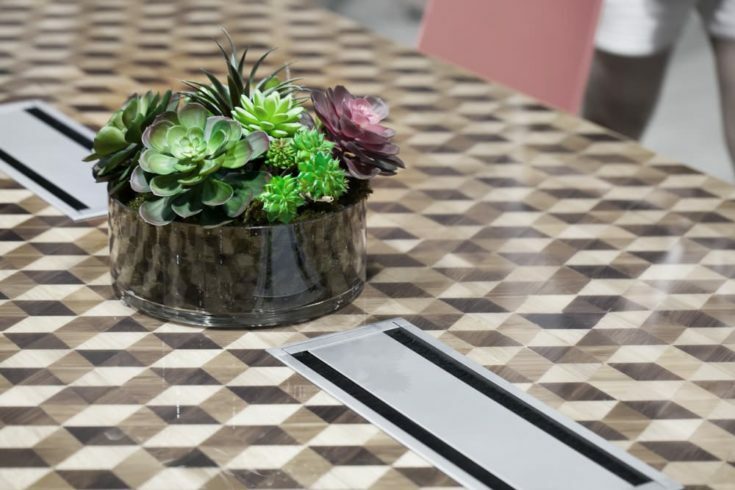 As you can see, there are so many different ways you can incorporate a terrarium into your home and you can’t really go wrong. You can also add a larger or a smaller terrarium gave space and area you’d like to incorporate one into. Do you have any experience with these min gardens? Have you ever built one yourself or given one away as a gift? We’d love to hear from you about it! Let us know in the comments about your experience with these cute little plant houses so we can all gain some interesting perspective.